The modern day Pinochle game has its roots in the European family of games known as Bezique. The modern and most popular versions of the game are American in origin, and date to the 1860s. 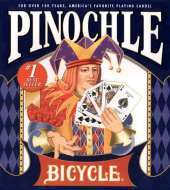 Now Bicycle proudly brings you the next evolution of the game, enabling you to experience the wholesome family entertainment of computer Pinochle, at its most sophisticated and exciting. Whether you play against the animated computer characters, one-on-one against on-line opponents, or against the card sharks on the Microsoft MSN Gaming Zone, this is U.S.P.C. sanctioned Pinochle as you've never played it before. The easiest menu-based interface of any card game software. Customize 14 playing environments, 15 card deck designs, and 5 music tracks. 10 Wild, animated computer "opponents". Awesome graphics. On-screen, step-by-step tutorials when you need them. Hints, replay, and review features. Challenge or chat with online opponents from around the block - or around the world. Six game variations - Three-Hand, Auction, Two-Hand, Four-Hand, Partnership and Partnership Auction to 1,000 points. Customize the game to your preferred method of play by selecting scoring options, scoring methods, and auctions, even choose how you head the trick, trump only or all suits. Features modem, network, and Internet play, or free multi-player action via the Microsoft MSN Gaming Zone.